You can add videos to your IBM Cloud Video account by recording your live broadcasts, or by uploading previously recorded content using IBM Cloud Video's upload tools. This article describes the different upload capabilities offered by IBM Cloud Video. Please contact your account representative to learn more about professional services. From the dashboard, click the upload button in the top right of your screen. Select the channel you wish to associate this video with. Click Videos to go to the video management page. 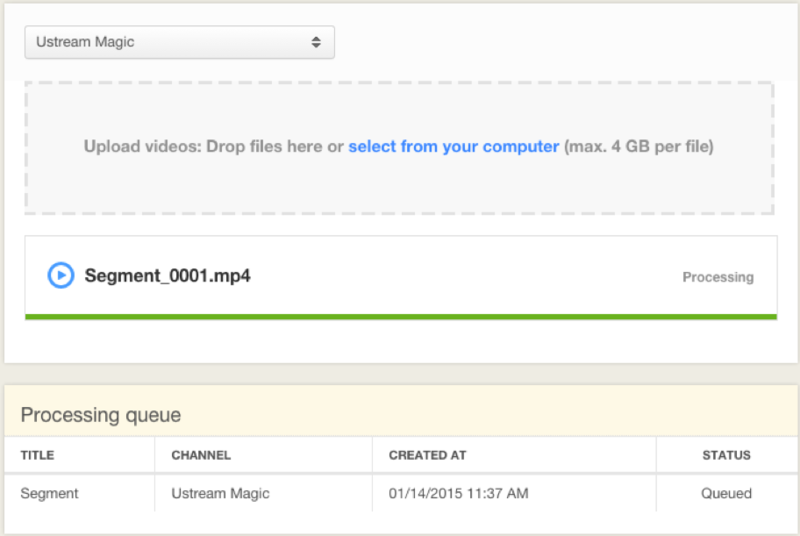 You'll see the Upload button and also be able to browse any previously recorded or uploaded videos for this channel. Before the upload starts, you need to enter some details for each video. Name is the title that will display in the video list and above the player during playback on the IBM Cloud Video channel page. You also need to enter a Description, although this can be the same as the Name field. Note that you can change this information later. 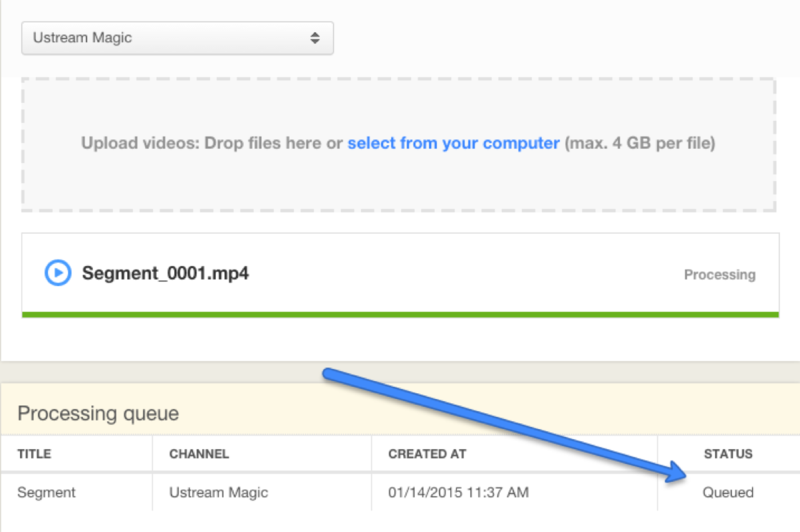 When details for all videos are complete, click Upload to start the import process. Upload time depends upon the speed of your internet connection, and you track progress by watching the progress bar for each video. Video files can be large, so allow some time for this process to complete and do not navigate away from the page while uploading is underway (this will cancel the upload). You are free to start uploading additional videos while encoding is underway. When complete, your videos will appear in the Videos tab. By default, the most recently uploaded or recorded videos appear first in the list, but you can also choose to sort them alphabetically. From within the Videos tab you can preview them, edit their details, make them private or public, share them to YouTube or re-download and delete them. Click on a video thumbnail to start playback from your channel page. Your browser will navigate to the channel page and start to play (videos need to be marked public for this to work.) The URL shown in your browser gives the link you can share with others to let them watch this content on your channel page. For larger files and faster uploads, please see the instructions for Aspera accelerated video upload. 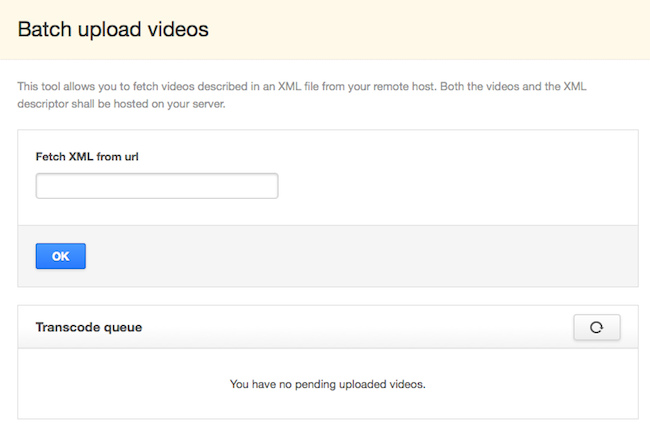 The IBM Cloud Video XML video upload tool allows you to transfer large video libraries to your IBM Cloud Video channel. Videos must be hosted on a server where they can be accessed via HTTP or FTP links without any redirects or authentication. Links entered in the XML file must end with a valid video file extension, such as .mkv, .mp4, .mov, .flv, .avi, .wmv, etc. The XML video upload tool does not allow for transfer via authenticated FTP or any other method that requires logging in. Your <tag> section should contain no spaces. Once the XML file is created, host it on your own server. 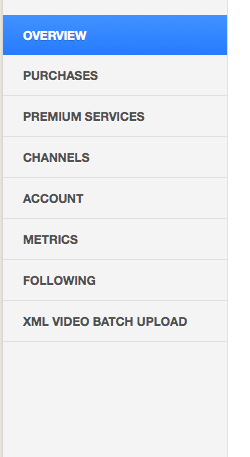 In your dashboard, navigate to the XML video upload tool. Enter the URL of where the .xml file is hosted. The tool will first import and read the xml file, then it will begin importing the videos. The status of the video imports can be viewed on the same screen. The importing is done between the servers, you can navigate away from this page with no effect on the import.